Add Hershey syrup, mix well. Add chopped nuts, if using. Pour batter into pan. Bake for 35-40 minutes or until brownies test done with a toothpick. When the brownies are almost done baking, prepare icing. Bring to boil in the microwave, the butter, cocoa and 1 T. milk. In a mixing bowl, add confectioners' sugar. Add the cocoa mixture to the sugar and beat well. Add 1 t.
vanilla extract. Add the rest of the milk. Add enough to get the desired spreading consistency. nuts, if desired. 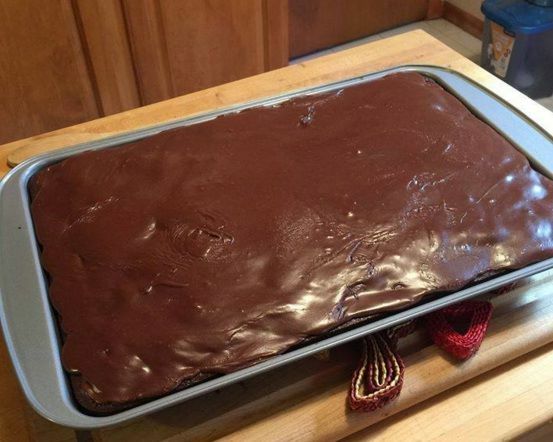 The icing will harden to a fudge-like consistency.